Even in good times, it takes steady nerves and deep pockets to embark on a major building project. But fortune favours the brave, and Graeme Simpson, co-founder and chairman of specialist house-builder Millgate Homes of Twyford, Berkshire, was undeterred by the previous failure of rival developers when, in 2011, he bought the dilapidated, Edwardian Penbury Grove near Penn, Buckinghamshire, from the Official Receiver, and embarked on an ambitious project to re-create the secluded, 25-acre estate in the heart of the Chilterns AONB. Mr Simpson explains: ‘There has always been a grand house at Penbury Grove, but what really impressed me was the quality of the landscape laid out when the house was built in the early 1900s, which, despite becoming totally overgrown in recent years, has matured into a wonderful parkland setting with swathes of magnificent woodland, including some splendid limes, cedars, copper beeches, chestnut trees and oaks. We looked at the possibility of res-toring the original mansion, but came to the conclusion that years of institutional use and subsequent neglect had left it beyond repair. ‘In the end, the quality of the house was simply not good enough to warrant the expense of reconstruction, so we commissioned the architect Robert Adam-with whom we had already worked on other major projects, including the redevelopment of Grade I-listed Sundridge Park at Bromley, Kent -to draw up plans for a new, 25,000sq ft, Georgian-style country house on this unique site. Our plans have been approved, although the internal layout could be altered to suit a new owner. The original Penbury Grove was built in 1902 by the brilliant American engineer Horace Field Parshall, who was involved in the electrification of tramways and railways in Bris-tol and London. His new house near Beaconsfield was designed as a replica of Pennsbury Manor, William Penn’s house in Pennsylvania. Hidden behind established evergreen hedges, Penbury House is protected by its woodland on three sides, with views to the south and west over open countryside. The grounds laid out by Parshall include his recently discovered Alpine garden created from more than 300 massive stone boulders, most transported by train from Derbyshire, with some weighing more than 13 tons. Set against Penbury’s sylvan backdrop, Mr Adam’s replacement mansion will have an imposing main front built in a contrasting mix of Portland stone and handmade Michel-mersh brick. The main house will have accommodation on three floors, including a grand reception hall, four reception rooms, a large kitchen/family room, a snooker room, and eight bedroom suites. The west wing will house garaging for 12 cars and service accommodation, the east wing a leisure suite and swimming pool. For selling agent James Crawford of Knight Frank (020-7861 1065), all these elements, plus Penbury’s outstanding location near Junction 2 of the M40-a mere 30 minutes’ drive from London’s West End-represent a unique package that could even whet the appetite of that small but influential group of international investors that continues to dominate the upper reaches of London’s residential market. The renovation of pretty, Georgian Warehead House at Halnaker, four miles north east of Chichester, West Sussex -currently for sale through Chesterton Humberts (020-7594 4746) at a guide price of £1.7m-presents a rather less daunting prospect. Built in about 1845 as a farmhouse on the Goodwood estate, it was sold by the estate in the early 1950s. Bought by its present owners as a weekend home in 1980, it stands in two acres of grounds within the newly designated South Downs National Park. Now surplus to requirements, it has four reception rooms, a kitchen/breakfast room, four/five bedrooms and four bathrooms and needs updating, but little internal alteration, although an oak-beamed, three-bedroom cottage, connected to the main house on the ground floor, could be incorporated into the main building to create one much larger, family country home. If greater age and antiquity are called for, then charming, 13th-century Forge Cottage on the common at Dunsfold, Surrey, boasts enough ancient timbers to build a mini-flagship. Reputedly the oldest house in one of Surrey’s most popular villages, 6½ miles from Godalming, Forge Cottage, listed Grade II, is now for sale through Strutt & Parker (01483 306565) at a guide price of £695,000. The fabric of the cottage has been well maintained, but the accommodation, comprising a drawing room, a kitchen/breakfast room, three bedrooms and two bathrooms (one downstairs) needs reno-vating, at an estimated cost of £100,000-£150,000. A large period outbuilding could be converted to an office, studio or separate guest annexe. 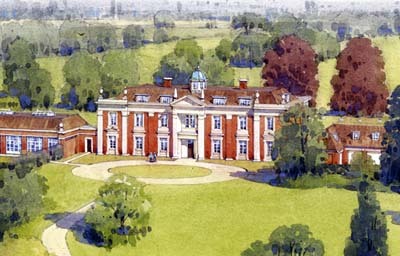 In contrast, the sale of Whet-stone Pastures House, with 27 acres of wooded parkland just south of the village of Whetstone, and five miles or so south of the central communications hub of Leicester, offers another chance to re-create an impressive country mansion in a classic estate setting. Strutt & Parker in Market Harborough (01858 433123) quote a guide price of £1.3m for the villa-style farmhouse, with its traditional brick barns and stable yard, originally built in about 1800. Few large houses existed around Whetstone before the arrival, in Victorian times, of the Hind family, who quarried slate on the surrounding Swith-land estate; they also enlarged and gentrified the farmhouse. Slate is still much in evidence throughout the house and estate, where the largest block of slate ever quarried can still be seen. Like many once-grand country houses, Whetstone Pastures House, listed Grade II, was sold by the Swithland estate’s current owners in the 1960s as an old-people’s home and continued in institutional use for the next 40 years. Richard Brooks of Strutt & Parker reckons that it would take anything from £500,000 to £1 million to remodel the house and outbuildings as a single private house in a manner that would both match the setting and please the local planners. If required, the owners are prepared to retain the outbuildings, although the restoration would still involve the removal of superfluous additions to the main house, which currently has five reception rooms, a former billiard room, 14 bedrooms, three bathrooms, a kitchen, offices and cellars.